These laws are designed to ensure that the Words of Power Chants work at their best, and to keep you close to the spiritual world from whence you come and to where you will inevitably have to one day return. 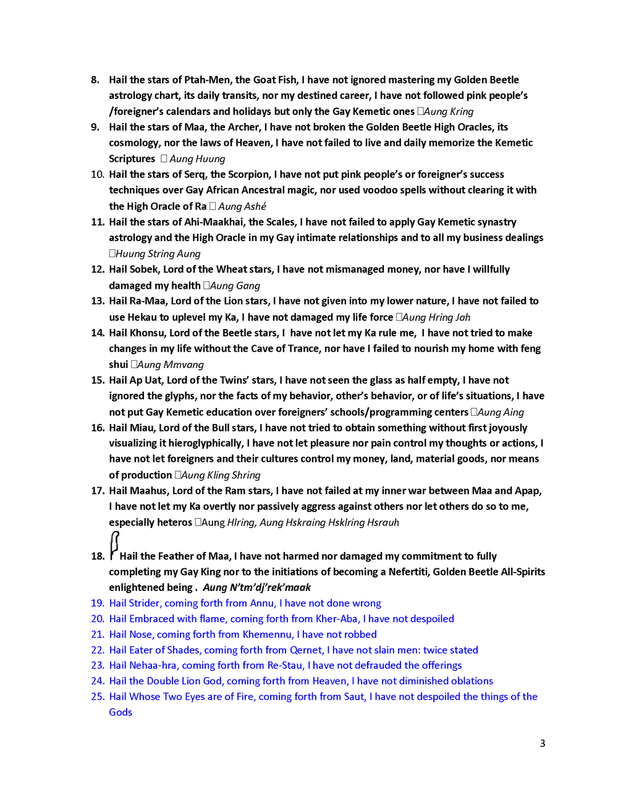 Memorize these laws, and see your life swell with love, joy, and abundance, while meditating on King Ra Suma Ba's sacred musical chants. 50. Hail Lord of Two Horns, coming forth from War City, I have not multiplied my words upon words. 51. Hail Nefer-Temu, coming forth from White Walls City, I have not harmed, I have not done evil. 52. Hail Temu in His Seasons, coming forth from Stability, I have not made curses of the King. 53. Hail Working in His Heart, coming forth from Sandal City, I have notfouled the water. 54. Hail Sistrum Bearer, coming forth from Nu, I have not made haughty my voice. 55. Hail Provider of Mankind, coming forth from Weaver’s City, I have not cursed Neter. 56. Hail Maker of Attributes and Forms, coming forth from his cavern, I have not committed theft. 57. 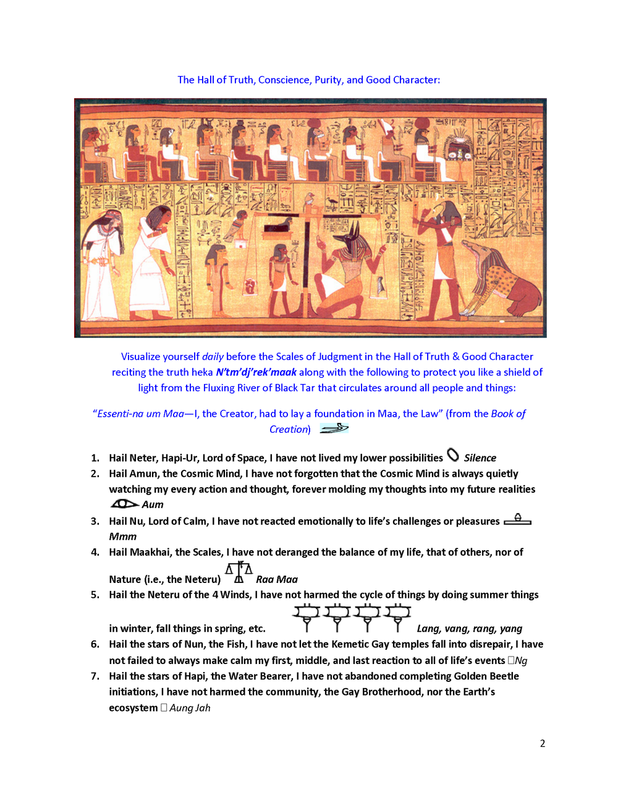 Hail Neheb-Nefer, coming forth from his cavern, I have not defrauded the offerings of the Neteru. 58. Hail Arranger of His Head, coming forth from his shrine, I have not carried away offerings from the Divination Readings. 59. Hail Bringer of His Arm, coming forth from the Town of the Double Truths, I have not carried off the food of the infant, I have not sinned against the Neteru of the Town. 60. Hail White-Teeth, coming forth from Lake-Land, not have I slaughtered the divine cattle. 61. Hail Maa-ti, I have not done harm to animals. 62. Hail Maa-ti, I have not done wickedness in the place of Maa-ti. 63. Hail Maa-ti, I have not acted wickedly. 64. Hail Maa-ti, I have not overworked myself (unnecessarily). 65. Hail Maa-ti, I have not had my name come to the boat of the Prince. 66. Hail Maa-ti, I have not despised Neter. 67. Hail Maa-ti, I have not caused affliction. 68. Hail Maa-ti, I have not done what is abominable to Neter. 69. Hail Maa-ti, I have not caused harm to be done to the servant by his chief. 70. Hail Maa-ti, I have not caused pain. 71. Hail Maa-ti, I have not killed. 72. Hail Maa-ti, I have not done harm to mankind. 73. Hail Maa-ti, I have not appropriated the offerings of the temples. 74. Hail Maa-ti, I have not carried off the offerings of the blessed dead. 75. Hail Maa-ti, I have not added to or diminished the offerings. 76. Hail Maa-ti, I have not stolen from the orchard. 77. Hail Maa-ti, I have not trampled down the fields (of another). 78. Hail Maa-ti, I have not added to the weight of the scales (cheated in business and agreements). 79. Hail Maa-ti, I have not diminished the weight of the scales (in business and agreements). 80. Hail Maa-ti, I have not driven away the cattle which were upon their pastures (not over harming animals in their natural habitat). 81. Hail Maa-ti, I have not captured the birds of the preserves of the Neteru. 82. Hail Maa-ti, I have not caught fish with bait of their own bodies (not using people’s trust against them). 83. Hail Maa-ti, I have not turned back water at its season (not wasting water). 84. Hail Maa-ti, I have not interfered with the course of the waters. 85. Hail Maa-ti, I have not extinguished a flame at its hour (not ignoring my chi rituals at their transits/not harming others Maatian destiny’s dreams). 86. Hail Maa-ti, I have not violated the (transit) time for a chosen offering. 87. Hail Maa-ti, I have not driven back the cattle (zodiac signs) of divine thing. 88. Hail Maa-ti, I have not denied Neter in His manifestations. These are designed to keep you close to the spiritual world from whence you come and to where you will inevitably have to one day return. Memorize these laws, and see your life swell with love, joy, and abundance. A downloadable version (pdf) can be obtained HERE.